Pros: Great big bowl. Beautiful color. Get some awesome glass flower screens, and you won't regret it. Pros: Very thick glass! Love the colors! Pros: I had received the bowl last night and was quite excited when I opened it! 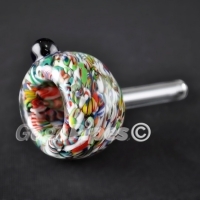 Looks great with the colors and design and also very thick bowl. It only took 6 days to arrive! It is very worth it and fits perfectly! It is almost a 2 g party bowl for anyone expecting a smaller bowl size.